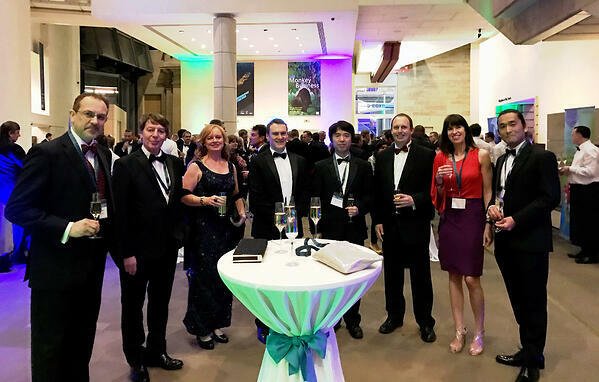 Scotland’s Life Sciences Dinner was held on 2nd February 2017 at the National Museum of Scotland. The event was attended by CEO and Chairman of REPROCELL Inc, Dr Chikafumi Yokoyama, as well as senior management members of REPROCELL Europe Ltd, to join and celebrate the outstanding achievements of the Life Sciences sector in Scotland over the past year amongst over 800 guests. Dr David Bunton, CEO of REPROCELL Europe Ltd, was one of the three finalist nominees at this year’s Life Science Business Leadership Award, which was part of Scotland’s Annual Life Science Awards and Dinner, 2017. ABOVE: Banquet attendees from REPROCELL corporate and REPROCELL Europe are shown. From left: Professor Stefan Przyborski, (CSO REPROCELL Europe), Professor Bill Stimson, (Alfacyte), April Kelly, (Scottish Enterprise), Dr David Bunton (CEO REPROCELL Europe, Life Science Business Leader Award 2017 nominee), Dr Chikafumi Yokoyama, CEO of REPROCELL Corporate offices in Japan), Ed Hutchinson, (Scottish Enterprise), Dr Karen Bingham(COO, REPROCELL Europe), Daisuke Usui (CCO REPROCELL Europe). Although not selected as the 2017 winner, Dr Bunton and ReproCELL Europe were honoured to be recognized as a finalist at the event. Our future plans are bold and aggressive, providing hope to compete again in the coming years. It was our pleasure to participate in the event as a member of such a vibrant and active community of life science companies in Scotland, with world renowned researchers, clinical experts, and business managers. The Scottish Enterprise Association’s refreshed Life Sciences Strategy for Scotland – 2025 Vision was launched at the event, setting out the strategy to grow the already sizeable contribution that life sciences makes to the Scottish economy: the publication features researchers at REPROCELL’s human tissue lab in Glasgow (page 2). The strategy can be viewed at http://www.lifesciencesscotland.com/. 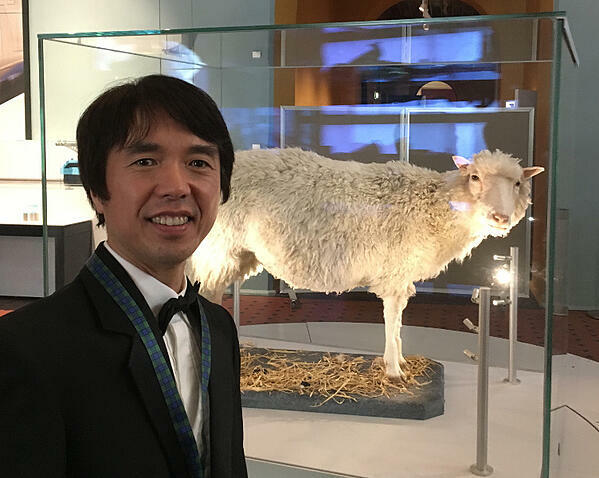 ABOVE: The CEO of REPROCELL Inc (Japan), Dr Chikafumi Yokoyama, with Dolly the Sheep, exhibited at the National Museum of Scotland.